In today’s political environment, you can’t afford to miss a headline. That’s why thousands of government leaders subscribe to Governing’s email newsletters. Register today to get breaking news and analysis that matters to you. Scan the day’s headlines, as well as original and breaking news of special interest to state and local government readers. 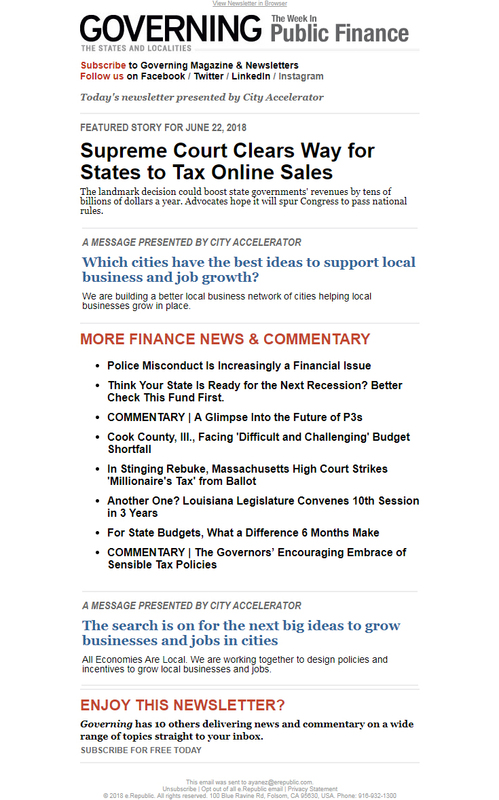 Read-it-first access to Governing's top print stories each month plus online-only extras including a calendar of state & local events, policy briefs and white papers. 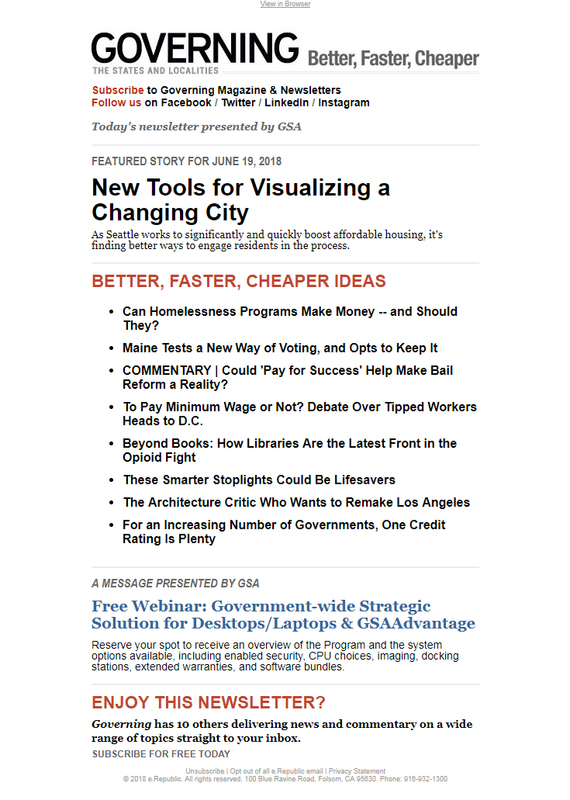 Sign up for Insider and never miss another issue of Governing. Discover innovative ideas for governments looking to provide real value to the public while lowering the cost of services. Get the best data-driven stories and graphical visualizations on notable data releases pertinent to many areas of state and local government. Read in-depth analysis of budget policy, bond financing, and public pensions. This weekly roundup of the top fiscal news from the nation’s states, cities and counties highlights the stories that matter most to public-sector leaders. Learn more about how state and local government leaders can apply system engineering concepts as they work to ensure prosperous futures for their citizens. Get a summary of developments and issues relating to the delivery of social services such as welfare and healthcare. Find policies, practicalities and politics of state and local infrastructure across energy, water, waste, transportation, urban planning and the built environment. Read exclusive features by management experts and government management consultants. Can't keep up with the 24/7 news? Governing's veteran political reporter Alan Greenblatt has you covered, breaking down the most important election news and the political dynamics affecting how state and local governments manage their challenges.